26th July 2018- A frontline player in the FMCG market, Modi Naturals marks their presence in the ready to cook food market with a new range of premium quality popcorn, PIPO. This all-time favorite movie snack has become an integral part of at-home easy foods with the introduction of ready-to-cook popcorn packs in India. Further, the classic salted and butter popcorn is no longer the only option to choose from. Arrays of flavour fusions and diet variants have taken over the market. “PIPO offers a range of exciting seasonings to choose from. We are adding value to regular popcorn with a unique mix‘in taste bomb seasoning sachet that will multiply the taste and aroma of this universal snack. It is a healthy, guilt-free munching option being made from 100% gluten-free, premium quality wholegrain corn which is enriched with zinc, copper, fiber, antioxidants and other nutrients. Keeping in mind the imperatives of the millennial health conscious eater, the saturated fat used in ordinary popcorn has been replaced with olive oil and vegetable oil. PIPO will democratize the intake of popcorn in the country because it is so easy to cook and has distinct variety on offer”, said Mr. Akshay Modi, Executive Director, Modi Naturals. In India, the at-home popcorn consumption market is worth over Rs.200 cr. Popcorn is a bang-for-the-buck food, cheap and light on gut. Unlike the popcorn sold by roadside vendors, gourmet popcorn is grown in a specially treated soil that produces a more chewy texture and a maize corn that can pop to about 40 to 60 times its original seed. Butterfly is one of the shapes that this corn can pop into. “We are excited to have our own space in this lucrative market. We have always believed in bringing change and breaking the monotony of existing markets. Our product is uniquely Indian in nature in the selection of its spices. In the next few months, we plan to stretch our arms throughout India. 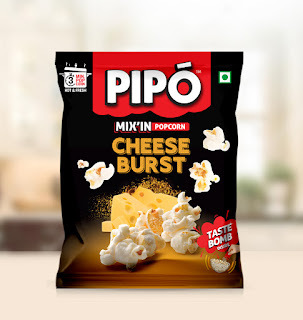 PIPO will Indianize popcorn with its scrumptious seasonings and we are confident it will become every urban household’s go-to snack in no time”, added Mr. Akshay Modi, Executive Director, Modi Naturals. PIPO aims to capture the millennial demographic in this country and leave a mark on the food lover’s psychographic, in particular, on those who are hard pressed for time, love having fun and enjoy experimenting with their food habits. Modi Naturals has earned the trust with over 50 years of continuous commitment to quality. Going beyond the ordinary since 1974, Modi Naturals has recorded an annual gross turnover of over 293 crores in FY 2016-17. Its products have been bringing exquisite taste and health to consumer’s wish list. Modi Naturals has been in our endeavour to help our consumers get more out of life, Modi Naturals has been offering the best range of healthy cooking oils and food products, supported by our rich heritage, intense R&D and superior quality raw materials. It is our pursuit of excellence that reflects in our premium range of products. Being the first company to launch blended olive oil in India under its flagship brand Oleev, Modi Naturals has been the fastest growing blended oil brand in the last 5 years.